Heat oven to 400°F. Bake pie crust as directed on package for one-crust baked pie shell. Cool completely, about 30 minutes. In large bowl, stir lemon peel into ice cream just until well mixed. Quickly spread 1 cup ice cream mixture in crust-lined pan; return remaining ice cream to freezer. Freeze pie until partially frozen, about 30 minutes. In small bowl, mix pie filling and lemon juice until well blended. Spread evenly over ice cream mixture in crust-lined pan. Freeze 45 minutes longer or until partially frozen. Spoon remaining ice cream mixture over top; spread evenly to cover. Freeze at least 4 hours or until firm in center. 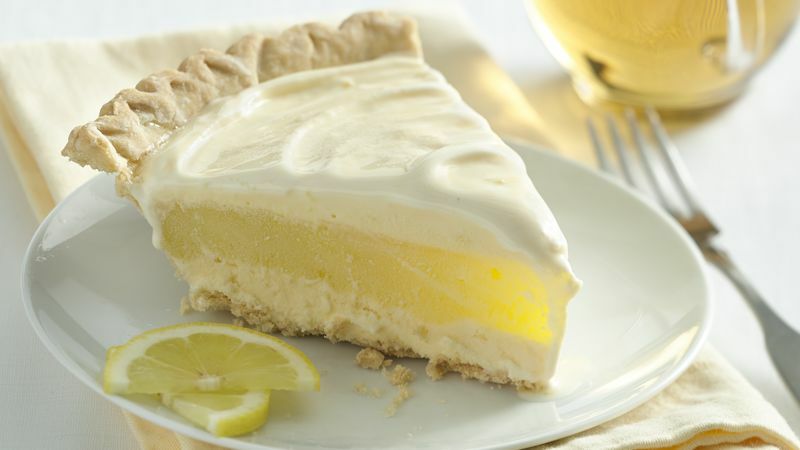 To serve, let pie stand at room temperature 10 to 15 minutes before cutting into wedges. Garnish with lemon slices. Freezing the pie layers separately takes a little extra time, but pays off in making it easier to spread the layers and keep them separate for a beautiful presentation. Top each serving with a few fresh raspberries or blueberries for a colorful garnish.